Juju is an open source application modelling tool. With it, you can deploy, configure, scale, and operate your software on public and private clouds. In so doing, Juju creates machines in the cloud you've chosen to use. One such machine, the controller, acts as the central management node for that cloud. 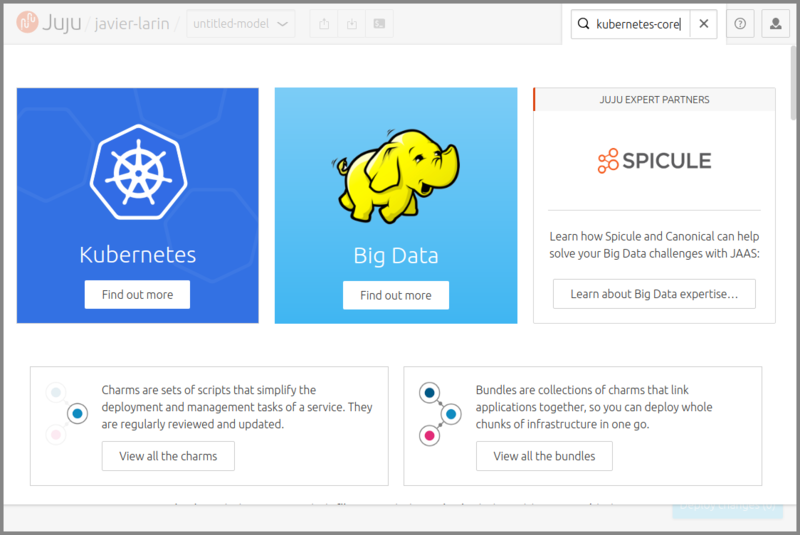 This guide will introduce you to Juju through the use of JAAS (Juju as a Service). JAAS is a web application that is equipped with everything you need to start using Juju, including a controller. The clouds that JAAS supports are: Amazon AWS, Google GCE, and Microsoft Azure. You will therefore need an account on one of these clouds in order to use JAAS. Note that Juju itself supports many more clouds. The use of JAAS does not preclude the use of the command line client for managing Juju. Anything you do in JAAS is transparent to the Juju client, and vice versa, providing the same controller is being used. We'll provide insight into this along with a crash course on client usage. Ensure you have an Ubuntu SSO account before contacting JAAS. Log in to JAAS now! Applications are contained within models and are installed via charms. 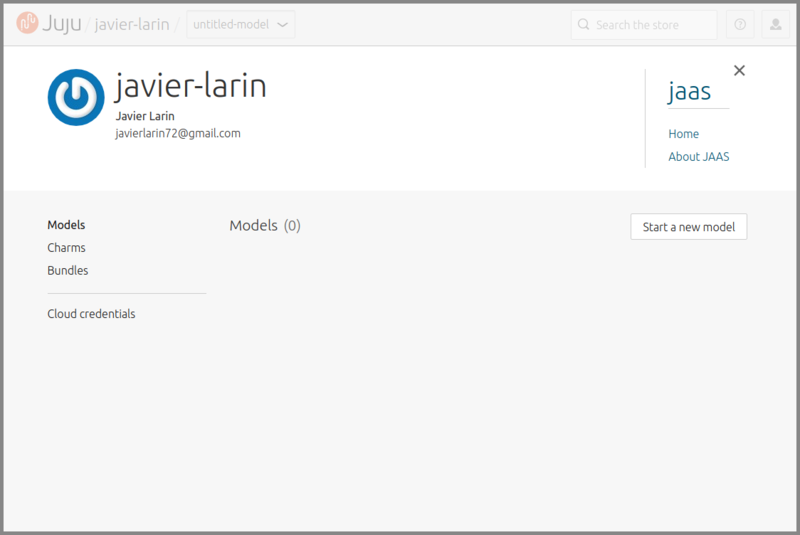 Configure your model by pressing the "Start a new model" button. Press the "Start a new model" button. This new model is currently empty. Press the green circle in the middle of the canvas to be transported to the Charm Store where you can use the search facility (top-right) to locate a charm or bundle (a collection of charms). Notice how the Charm Store is integrated into the JAAS experience. Here, we've decided to search for the 'kubernetes-core' bundle. This bundle is complex enough to be interesting but not overwhelming. It involves five applications and two machines. 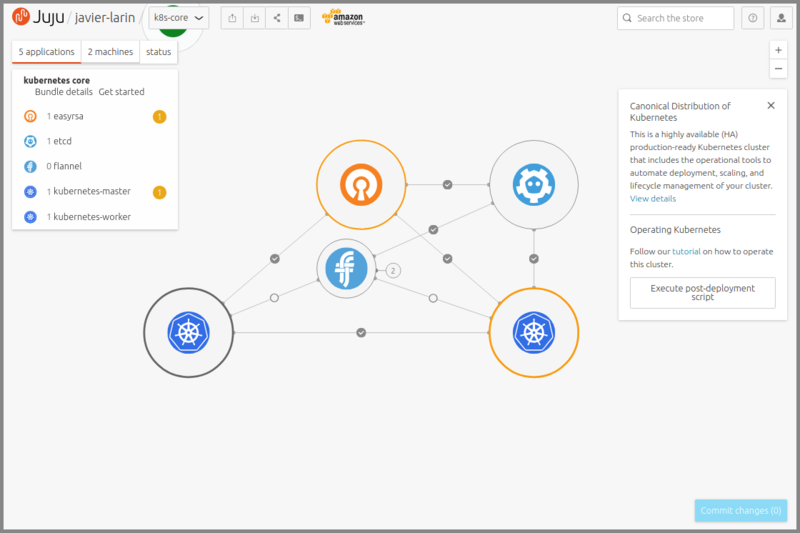 If you're looking for the high-octane experience, choose the 'canonical-kubernetes' bundle. A charm/bundle is added to your current JAAS model by pressing the "Add to model" button. Search the Charm Store. Add a charm/bundle by pressing "Add to model". Once a charm/bundle has been added to your model a simulated construction will begin. At this time your chosen cloud has not yet been solicited. What we've done so far is "primed" our desired configuration. This is particular to how JAAS works; the Juju client operates in a more direct fashion. 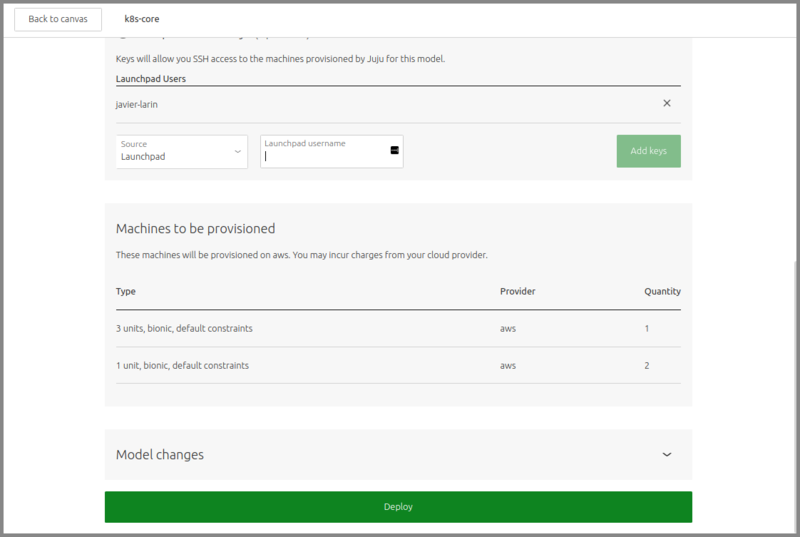 Once you hit the "Deploy changes" button you will be able to name your model and select the cloud you want to use. Here we've called the model 'k8s-core'. This bundle has been added to the model. This model has been named. A cloud is not yet selected. Pro tip: Generate a set of credentials dedicated to the use of JAAS. There is also the option of adding public SSH keys to the model. This results in every machine residing within it having those keys installed (in the 'ubuntu' user account). Once a key has been selected you must press the "Add keys" button. 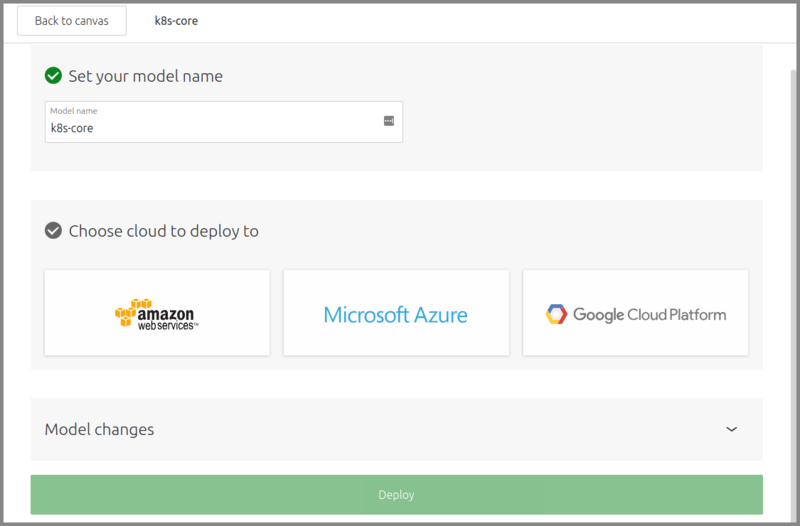 Click on the big "Deploy" button to confirm your cloud information, create your model, and deploy the charm/bundle. The complexity of the chosen charm/bundle determines the deployment time. During this time, cloud instances are being created, software is being installed, relations (the lines between the charms) are being set up, and default configuration is being applied. SSH keys have been added and the model is ready to deploy. This bundle's deployment has just been initiated. As the applications become operational, the colours on the canvas will reflect the state of the charms. Amber indicates "working" and grey indicates "idle". A successful deployment should show grey everywhere. This bundles is still deploying. This bundle is now deployed. Congratulations! 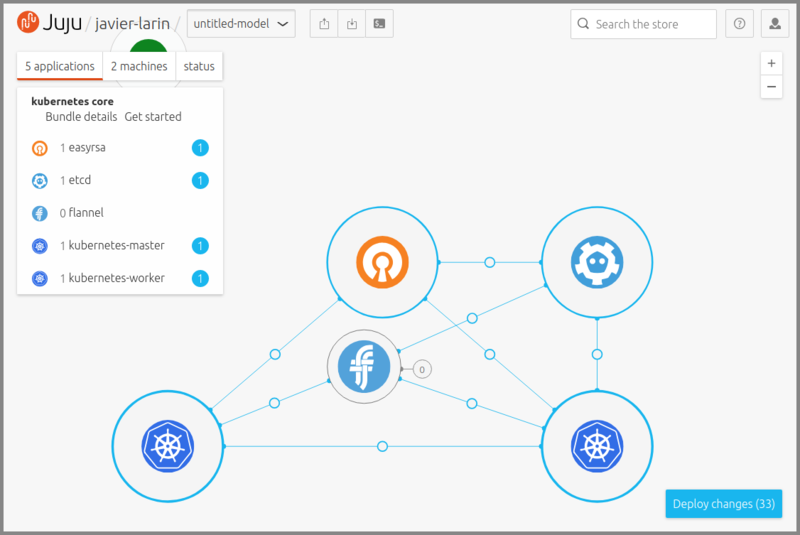 You just deployed a respectable workload in the cloud without hours of looking up configuration options or wrestling with install scripts! An individual charm can be removed by clicking on it and choosing the "Destroy" button. If there is no other charm being hosted by the underlying machine then the machine will also be destroyed. A model can be removed by clicking on your username in the top-left area of the window and hitting its trash bin icon. If you change your mind just click on the model name to return to the canvas. When a model is removed all machines and charms contained within it are also permanently removed. Pro tip: Model removal is often used as a way to quickly wipe out one's work. Try to therefore always organise your work on a per-model basis. You can either remove your work now, via the JAAS web UI, or do so later using the Juju client. Experienced Juju operators manage Juju from the command line client, and that includes the work done via JAAS. The client is obtained by installing Juju on your machine, where Windows, macOS, Ubuntu, and other Linux are supported. See the install page for guidance. This should direct your web browser to the Ubuntu SSO site that will authenticate your account. If this doesn't occur, just use the URL printed in the output. Opening an authorization web page in your browser. Couldn't find a suitable web browser! Set the BROWSER environment variable to your desired browser. Welcome, javier-larin@external. You are now logged into "jaas". 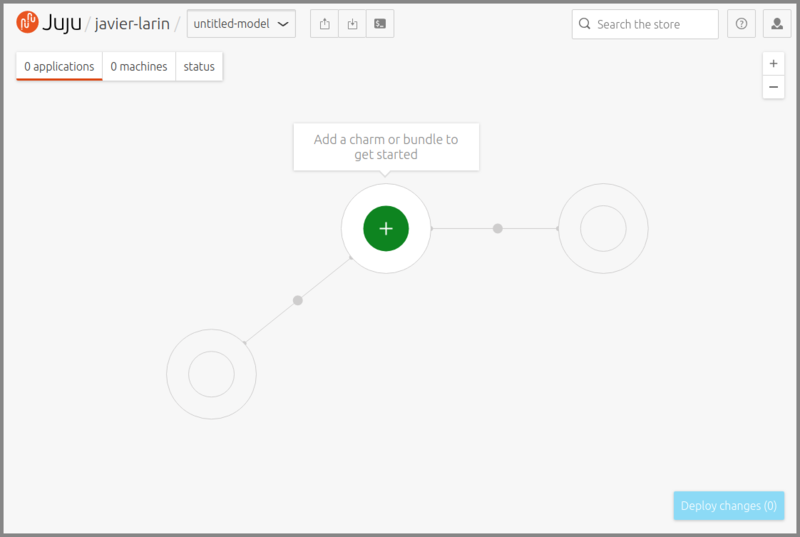 current model set to "javier-larin@external/k8s-core". There's our JAAS controller. The asterisk denotes the currently active one (in a non-JAAS context there could be multiple controllers). Now that we are connected to the JAAS controller our entire JAAS environment can be managed from the client. 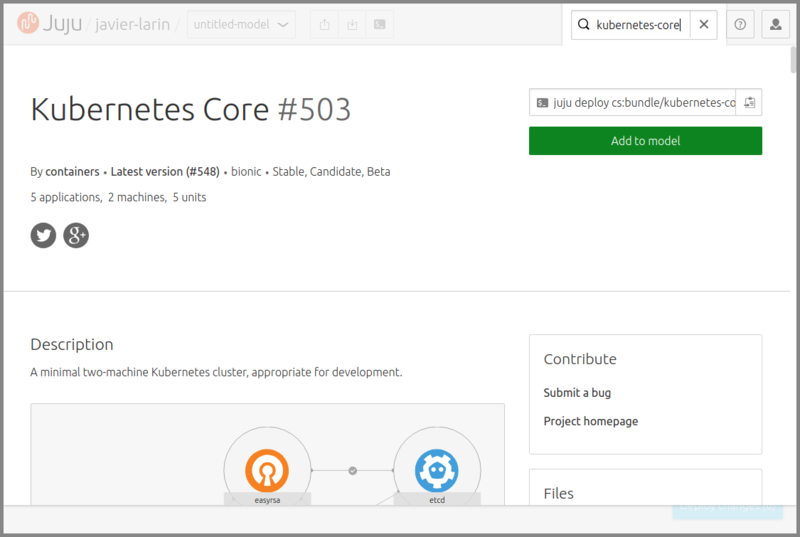 Already we see evidence of our 'k8s-core' model. Juju has a large number of commands at its disposal. Here, we will cover only the most rudimentary ones. Important: Unless Juju is told to do otherwise, a new charm implies a new cloud instance. To remove an application, including all units, along with associated machines (provided they are not hosting another application's units). This command is not destructive in nature. In a JAAS context in particular, it does not affect your JAAS environment, which can still be accessed either via the JAAS web UI or by logging in again at the command line. For a more in-depth look at client commands we recommend the Basic client usage tutorial. Important: Ensure you have removed any work done within JAAS. If you followed all the steps in this guide there were two instances created in your cloud.